According to the newspaper "Kommersant" in the article by Anastasia Vedeneyeva, "The Star" goes on the ice. The shipyard contracted the Arctic LNG tanker with Sovcomflot, Sovcomflot and Zvezda shipyard signed a contract to build a pilot gas carrier Arc7 for the export of liquefied gas from the Arctic LNG project NOVATEK. The vessel must be commissioned in 2022 and must undergo ice tests no later than April 2023. NOVATEK will charter a gas carrier for 25 years. Experts believe that in close cooperation between Zvezda and Koreans, as well as the presence of 15 Yamal LNG gas carriers Arc7 of the Yamal LNG project, the risks for the company due to the potential delay in delivery of the tanker are minimal. 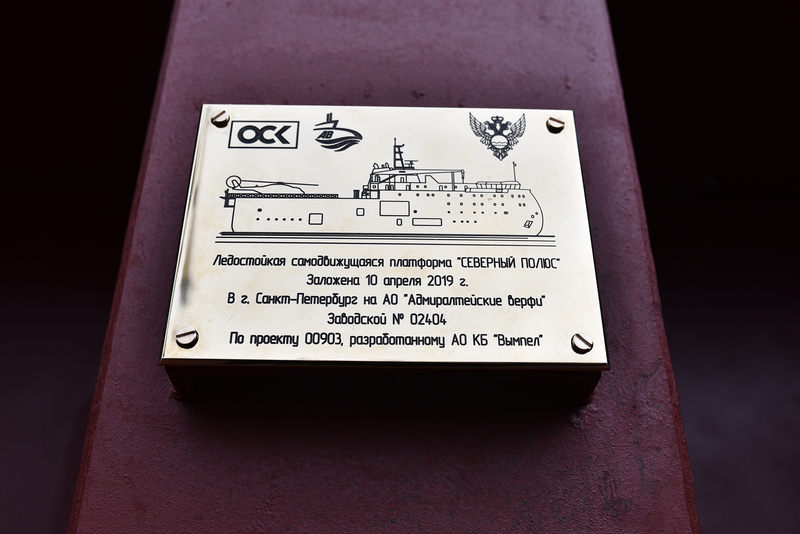 The official tab of the ice-resistant self-propelled platform "North Pole"
On April 10, 2019 in St. Petersburg, at the Admiralty Shipyards JSC (part of the United Shipbuilding Corporation JSC - USC JSC), as part of the V International Arctic Forum, an official groundbreaking ceremony for the North Pole ice-resistant self-propelled platform »Project 00903 (serial number 02404) for the Federal Service for Hydrometeorology and Environmental Monitoring of Russia (Roshydromet). The solemn event was attended by the head of Roshydromet Maxim Yakovenko, the chairman of the board of directors of USC JSC Georgy Poltavchenko, the president of USC JSC Alexei Rakhmanov, the general director of Admiralty Shipyards JSC Alexander Buzakov. As Kommersant newspaper reports in Anastasia Vedeneyeva’s article “They're sharpening a knife on old tankers. They propose to solve industry problems with their recycling,” Russian shipping companies are discussing a program to dispose of the old fleet for domestic traffic, by analogy with the use of railway cars introduced in 2016 . This measure was proposed by the head of AEON corporation Roman Trotsenko. The reason is a sharp drop in freight rates, which is why companies that have invested in the construction of new ships, primarily oil tankers, suffer losses. The owners of the old ships warn that such an approach will not solve the problem - cargoes with an increase in freight rates will simply go to the railway. The shipping community is discussing the possibility of limiting the service life of oil tankers. Such a measure on April 12 was the subject of discussion at the subcommittee on sea and river transport of the Russian Union of Industrialists and Entrepreneurs. Its chairman, head of AEON corporation, Roman Trotsenko, at the beginning of the meeting, recalled that the industry over the past three years has been in a serious crisis. Discounts of Russian Railways for transportation of petroleum products in the directions duplicating river routes, the rising cost of fuel and the devaluation of the ruble have led to an “unprecedented situation” in the reduction of freight rates by three times. A similar situation was in the rolling stock market, when rental rates for gondola cars fell four times. “The railway behaved responsibly, it was decided to reduce the old rolling stock. It was uneven across the industry, painful for some players. But, having made an awkward decision, they showed themselves as a viable and active institution, eventually stabilizing the industry, ”noted Roman Trotsenko. He stressed that while there is no consolidated solution. The common position should be formalized by April 22 at the RSPP commission on transport and transport infrastructure. The easy decision is usually wrong, the businessman summed up. The head of the Moscow River Shipping Company (part of AEON), Bakhtier Kasimov, proposed a ban on the operation of the tanker fleet over 40 years old, including those under a foreign flag (see chart). He added that such restrictions apply in Israel and the UAE. The head of the Russian Chamber of Shipping, Alexei Klyavin, recalled that restrictions on the operation of foreign companies would require the adoption of a law. Instead, he proposed lowering for the "new high-tech vessels" port charges and other preferences that would allow competing in the market. First Deputy General Director of Volgotrans Alexey Palgov suggested not to concentrate only on the oil fleet, but to take into account the dry cargo, passenger, and auxiliary services. He acknowledged that "the age fleet is not dangerous, it meets all the requirements." But, Mr. Palgov believes, it is necessary to consider the issue from the point of view of industry development. “We were seeking subsidies for the development of new shipbuilding, at the time of launch it stopped, there are no new orders. Hydraulic structures for whom we are building? ”He says. In his opinion, it is necessary to talk about the operational period for each type of fleet - as soon as the ship has completed it, it should leave. Advisor to the Director General of Rosnefteflot, Andrei Guzenko, spoke out against a severe limitation of the vessel’s service life. It would be more correct to make equivalent opportunities for operating the new and old fleets through taxes, insurance, he said. Rosneft is the main shipper for oil cargo in the European part of the Russian Federation; the company is also actively seeking discounts from Russian Railways, which representatives of the shipping industry consider to be one of the main reasons for the fall in freight rates. At current rates only the old fleet can work profitably. The representative of “Bashvolgotanker” spoke out most strongly against sending the old fleet for scrapping. “We considered the export of cargo from inland waterways to coastal areas, without going long-distance sailing. In fact, you have built a "sea-river" ships, with this class you can go to the seas and oceans, look for a cargo base in other regions. Now it turns out that big beautiful modern vessels climbed into our cake, ”said the first deputy managing director of the company, Vyacheslav Stepanov. Bashvolgotanker insists on developing measures to encourage the efficient operation of the new fleet, and not restrict the work of the old one. The main problem is to reduce the cargo base, and the restriction for the age fleet will not solve it, Mr. Stepanov concluded. As measures of support at the meeting, an increase in the ship's utilization grant, a zeroing of the excise tax on diesel fuel or an increase in the payment of the reverse excise tax, etc. were considered. If the age of fleet operation is limited, the business of some companies will be destroyed, and in some segments Russia will remain without a fleet at all, says the head of Infoline-Analitika Mikhail Burmistrov. The measure may be introduced pointwise - for example, in the segment of oil and dry cargo transportation. But in connection with the retirement of the fleet, freight rates may increase by 10–15%, which may be critical for the shipper, then the volumes will simply go to the railway. Without regulatory measures restricting the use of discounts within the tariff corridor of Russian Railways, such a measure is unlikely to be effective, and restrictions for Russian Railways are fraught with a decrease in the competitiveness of rail transport, concludes Mikhail Burmistrov.